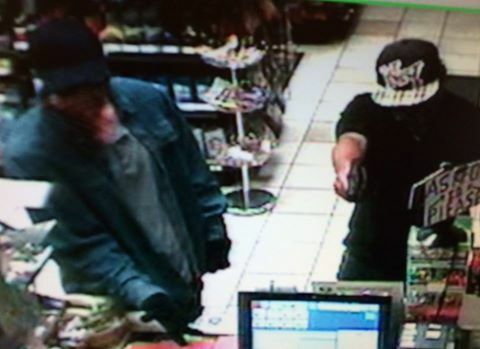 Atascadero police are searching for two suspects who robbed the Chevron gas station at 6280 Morro Road at gunpoint on Friday night. Shortly after 9 p.m., two suspects, one armed with a gun and the other wearing gloves, entered the store. One robber held a gun on the clerk while the other demanded money. The suspects then fled the scene on foot with an undisclosed amount of cash. Police are asking anyone with information about the robbery or the suspects to call the Atascadero Police Department at 805-461-5051. If convenience stores stopped accepting cash, and instead insisted on electronic payment, robberies like this would be a thing of the past. Not really. I mean, if they are employees of Walmart they’d be working at least instead of robbing people like the low lifes they are. They aren’t “suspects”. They did it. It’s astounding how dumb people are. Gas stations have surveillance cameras everywhere. All major intersections have surveillance cameras. It’s virtually impossible to rob a gas station today and get away with it. How can anyone not know this? The only way is to approach on foot and take off on foot. And park far away and hope you can get back to your car and get away before they surround you. All that for a couple hundred dollars. Go to jail for 7-15 (armed weapon enhancement) over 2 hundred dollars. The ultimate in stupidity. What Jail? Gov Brown will release them so he can spend the money on pensions and “pretend” to balance the budget. Wrong. Offenders such as these two idiots would not be eligible for early release. Get the facts, speak some truth…try it, you might like it.